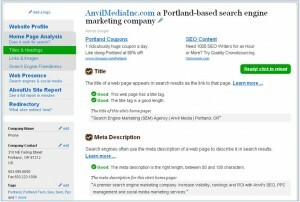 I recently tested out a couple of tools that analyze websites for key SEO tactics and implementation of these tactics. These types of tools are great for doing quick and easy analysis of sites and can help you find any SEO issues that may be hurting a site’s rankings. The first one, Screaming Frog SEO Spider, is a desktop application that provides specifics on title tags, H1 tags, redirects, external links and more – all of which are exportable. This handy tool helps you quickly go through a site and see where you can make some quick fixes. For example, you can easily identify which pages on your site have title tags with more than 70 characters and shrink those down to help with click through rates on SERPs. 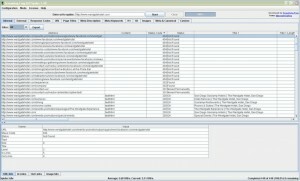 A great thing about this tool is that there is a free version available that lets you analyze up to 500 pages on a site. If you need to look at larger sites the full version, which analyzes over 500 pages, is only about $65 a year for one license. AboutUs Site Report is another tool that can help when you need to check out the implementation of standard SEO tactics on a site. This tool provides you with a good overview and clearly points out if there are issues, so you can quickly fix them. The main limitation on this tool however is that it only analyzes up 50 pages on your site, but if that’s not a concern of yours this tool could be a good choice. Something different this tool provides that the Screaming Frog tool does not is analysis of general web presence – which can be helpful. As for pricing – you can check out a homepage for free, but if you want to go deeper into a site it will cost you $9.95 a month. Out of the two tools my preference is Screaming Frog, but since they both offer free versions I suggest trying them both out and going with the one that best fits your needs.